Because the Mississippi level was fully free-lanced, it was much easier to design than the prototype-based New Orleans level. This was particularly true of Union Passenger Terminal. The upper level is divide into three distinct areas of the "Big Easy". Trains entering New Orleans from the east (MA&G, GM&O, Southern and L&N) pass behind the engine facilities of the Peoples Avenue Yard. This 32-foot long classification yard has separate arrival and departure tracks, a caboose track, and six sorting tracks for blocking cars. Along the back wall are several large industries which were kitbashed from multiple Walthers kits to represent the Central Business district. Each were given names based on prototype industries that existed in the 1950's. To service these businesses, a long rear siding was added off of the main which can be switched from either end or the middle via two crossovers. At the west end of the yard is a four-track icing facility kitbashed from eight Walthers kits! Here, block ice is received in dedicated reefers, re-sized and stored, then used for the icing of perishable freights carrying imported commodities such as bananas and other tropical fruits. The famous New Orleans waterfront is represented on the opposite wall. Arriving switchers with cuts of cars for set-out along the pier first pass through the enormous New Orleans Public Grain Elevator which was kitbashed from four Walthers Red Wing Milling kits. Two tracks run along the length of the 19-foot pier, which was kitbashed from five Walthers Pier and Traveling Crane kits. To represent the muddy brown waters of the Mississippi River, I poured an entire gallon of Envirotex 2-part resin which was tinted with Floquil paints. To create waves, gloss gel medium was stippled on with a stiff brush. Flying seagulls were mounted on thin brass wire so that they appear to swoop over the choppy water. I mounted two speakers under this area of the benchwork connected to an ITTC harbor sounds module. The first industry located on the pier is the Public Cotton Warehouse. I scratch-built this imposing structure from photos of the prototype, including the interesting rolling bridges which access the upper level of the building. Docked here is the tramp freighter Gulf Breeze. This scene-stealer, which was built from a Sylvan resin kit, was one of the most difficult things I have ever attempted to build. I created my own method for making the cotton bales which are being loaded in the cargo holds of the ship. The second structure on the pier is the Napoleon Avenue Wharf warehouse. This eight-foot long behemoth was kitbashed from three Walthers Rolling Mill kits. It, along with the other structures on the waterfront, conceals a hidden five-track yard. All roofs are removable for access and maintenance. Docked at the end of the wharf is the Creole Queen riverboat. This signature New Orleans element was built from an extremely challenging Artesania Latina kit and includes two smoke units that supply the two stacks. A customized ITTC sound module plays “When the Saints Go Marching In” for the jazz band that performs for boarding passengers. 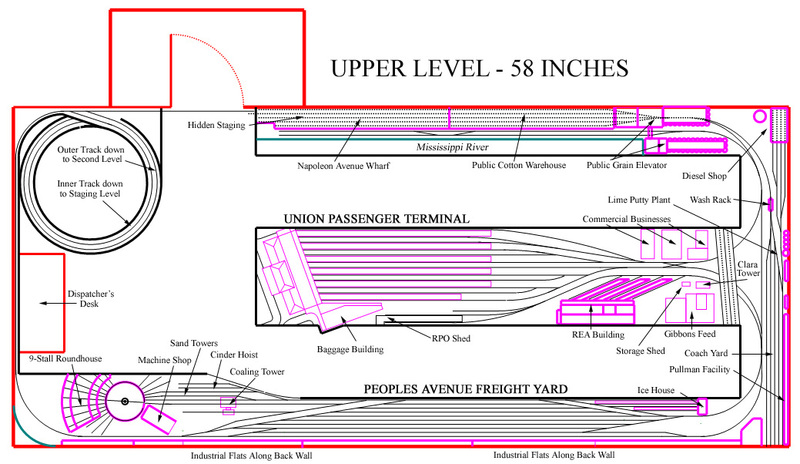 The focal point of the entire layout is the New Orleans Union Passenger Terminal. I knew that accurately fitting a facility of this magnitude into 100 square feet was going to require a lot of compression. Using John Armstrong’s famous Givens and Druthers philosophy, I established certain non-negotiables in my planning. First and foremost was my insistence that the station be modeled faithfully to scale complete with all 12 arrival/departure tracks. While accomplishing this goal was an arduous task, my biggest challenge involved the track arrangement of the yard throat. The actual NOUPT had 5 tracks while I only had room for three, which was acceptable. However, accurately duplicating the complexity of switches within that area was much more problematic. Not wanting to limit myself to passenger consists of five cars or less, I elected to substitute the numerous double slip switches of the prototype with a single double-crossover switch. This still allows trains to cross from one side of the terminal to another while maintaining a complex appearance. It also provides room for a minimum of 7 passenger cars plus head-end equipment to be spotted at each of the 12 station tracks. I felt this was both a functional and aesthetic compromise I could live with. Another design consideration dealt with the way the NOUPT relates to the rest of the upper level. In theory, the mainline track behind the People’s Avenue freight yard facilitates trains coming from the east (MA&G, Southern, GM&O and L&N). It would not look plausible to see the Southern Pacific’s Sunset Limited approaching from the same direction. To eliminate this problem, I designed a five-track staging yard which is hidden in the waterfront warehouses on the opposite side of the layout. This provides a point for all trains from the west to originate or terminate. In a typical six hour trick (3 hour op session), five tracks will be adequate for trains arriving and departing to “swap places”. It also allows trains coming from the west to enter from the left side of the layout and trains from the east to enter from the right. While these points of entry would have been miles away from the wye itself, it gives the right visual cues to operators. This is also in keeping with the directionally sincere aspect of the entire layout; east is right and west is left. Custom laser-cut by CMR (Custom Model Railroads) from scale plans provided by Dr. Nicholas Muff, my model of Union Passenger Terminal is an exact scale replica of the prototype. No selective compression was used for the station or the baggage building. Both boast a full interior constructed from prototype photos. Based on his research of the original blueprints of the building, Nick Muff had included a scale floor plan of the main concourse with all interior walls and rooms labeled. These markings were laser cut in the acrylic base and provided accurate locations for wall placement. The walls were then cut from styrene and overlaid with actual photos of the interior walls. Where modern details such as public phones and vending machines existed, I used Adobe Photoshop to replace them with their 1950’s-era counterparts. The beautiful wall murals, which are original to the station, were critical in creating an accurate interior. They were reproduced on sticker paper from original photographs. The ticket counter includes a scale reproduction of the Arrival/Departure board with the MA&G added to the roster. The 90 benches, which are very similar in style to the prototype, are passenger car seats made by Precision Scale. I scratchbuilt the free-standing news stand from prototype photos. One very nice architectural detail of the concourse is the metal grill work above the side entries. Because scratchbuilding something so intricate in HO scale was impossible, I had the patterns laser-cut on clear acrylic. To make the grills show up, I first rubbed gold acrylic paint on the entire etched side of each panel, and then rubbed it with a paper towel to remove most of the paint. All that remained were the accumulations in the grooves which not only made them pop out, but also colored them correctly. The tile floor, which is based on prototype photos, was created in CorelDraw then printed on sticker paper. To complete the full effect of the interior, ceilings were constructed from styrene sheet with “diffuser panels” cut from a clear sheet of “Safety Tread Checker Plate” material by Plastruct. Finally, a total of 45 grain of wheat bulbs was wired to illuminate the interior. The scratchbuilt Railroad Post Office sheds reflect the temporary construction that existed in 1954, the year the station was placed in full operation. Although the arrangement of the yard throat is simplified greatly, it was important to me that I include all 12 of the arrival tracks. The six passenger sheds were semi-scratchbuilt using modified components from 15 boxes of Walthers Butterfly Sheds! In all, more than 300 LEDs were used to light the entire facility. Further down, I've also modeled the Railway Post Office building with its unusual angled loading platforms. This large, scratchbuilt structure also has lights and a full interior. Finally, the Clara Street Tower was also laser-cut by CMR from plans drafted by Nick Muff. I based the interior details on a phone conversation I had with the last employee to work in the tower. It is dwarfed by the massive Gibbons Feed Mill which stood a few yards away. This structure, built from Walthers Modular components, is one of the tallest on the layout; standing less than 2 inches from the light valance. Like many of the New Orleans industries, it was based on prototype photos. Beyond it is the South Claiborne Overpass which was totally scratchbuilt from Google Maps images. To represent the complete operation of the Passenger Terminal, I included key support facilities along the back wall. Based once again on prototype photos, these include the diesel shop, sanding tower, wash rack, Pullman building and coach yard. While their arrangement was dictated by the available space, they will nonetheless effectively simulate the servicing of passenger equipment. Early in my research, I chose fourteen passenger trains I wanted to model and then recorded those prototype arrival and departure times based on the NOUPT Timetable No. 1 dated April 16, 1954; the day that the terminal was placed into full operation. These times were then entered into a spread sheet. The remaining available time slots were assigned to trains from the MA&G. Once I was armed with this piece of the puzzle, my focus shifted on how best to recreate the traffic patterns of the NOUPT on the layout. I began by dividing a full day into four, 6-hour operational periods, or “tricks”, which would best offer somewhat equal degrees of operating action and interest. Then I choreographed the arrivals/layovers/departures of consists to insure adequate staging, terminal, and coach yard tracks would be available to accommodate those moves. Here is a list of all of the passenger trains modeled, the session/time in which they arrive (A) or depart (D), and their assigned staging location. Follow the construction of the Peoples Ave Yard here. Follow the construction of NOUPT here. Follow the construction of the NOUPT support facilities here.